I usually go to the farmers market to buy odds and ends of things--whatever strikes my fancy. 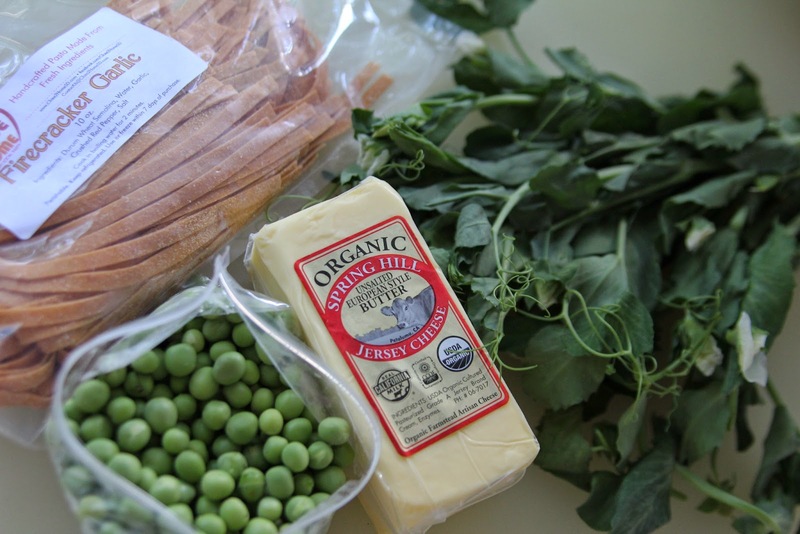 Last Sunday, I went to the Hillcrest farmers market to see what I could gather to make an interesting dinner. The trick was to find that one item to build the meal around. I found it at Sage Mountain Farms' stall: sugar snap pea tendrils. On a gloomy day that hinted of rain, there were those sweet pea flowers spoke to me of spring and I had to have them, especially since their season is short. 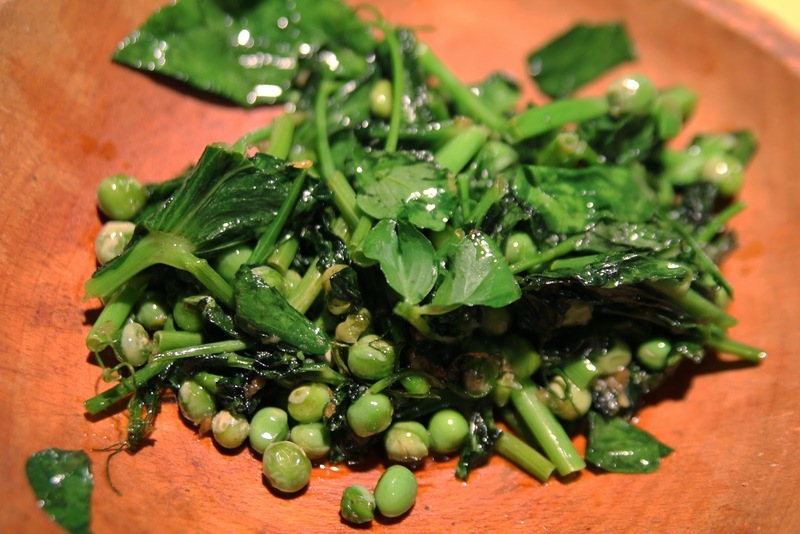 Pea shoots and tendrils can be enjoyed raw, chopped in a salad or snacked on, or sauteed. The young stems are crispy, the leaves a bit tart with a hint of pea flavor. I picked up two bunches and turned around to continue my shopping and saw my friends Tina and Eric of Close to Home pasta. Voila! I had my meal. 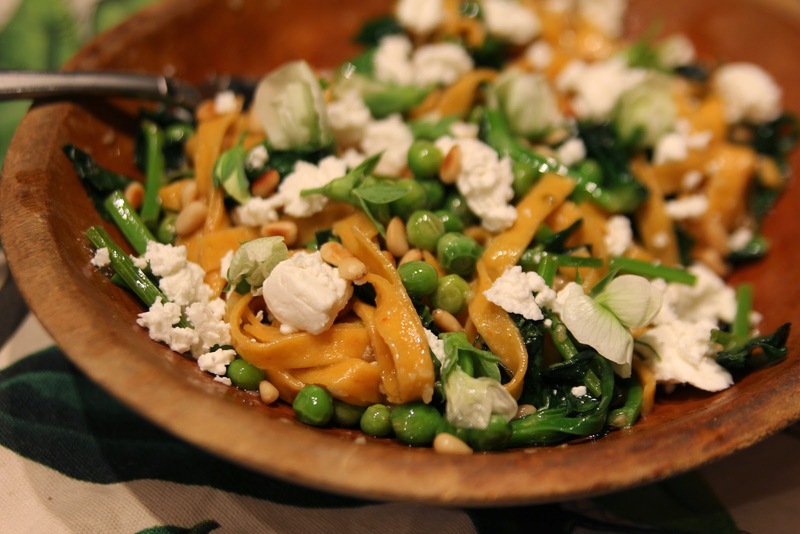 Pasta with pea tendrils. Nothing fancy or exotic, but the idea felt perfect. I picked up a couple of pastas: spinach and garlic penne and firecracker garlic fettucine. I can't resist spice or garlic. After consulting with Tina, we decided that the fettucine would pair best with the pea tendrils. Oh, and then I saw some shelled sugar snap peas at Valdivia farms. I bought a bag of those. Then some butter from Spring Hill Jersey Cheese. I was done. At home I had some pine nuts and goat cheese--and, garlic and olive oil. Oh, and a lemon. No need to buy those that day. I'd love to say that it's all I bought, but I was lacking in will power. I picked up a loaf of whole wheat sourdough bread from Prager Brothers and spicy Bitchen' sauce as well. Farmers markets are filled with temptation! Last night I pulled the meal together. It was simple, but think of the ingredients I was working with! 6. Removed the peas and tendrils and made the sauce--a bit more butter and olive oil, a bit more sea salt, juice from half the lemon, and the rest of the zest. 7. Added the pasta to the boiling water and let the sauce reduce. Sliced some goat cheese. That's it. I added the pasta to the pan filled with the sauce and tossed it to coat before adding the mixture to the peas and pea tendrils. 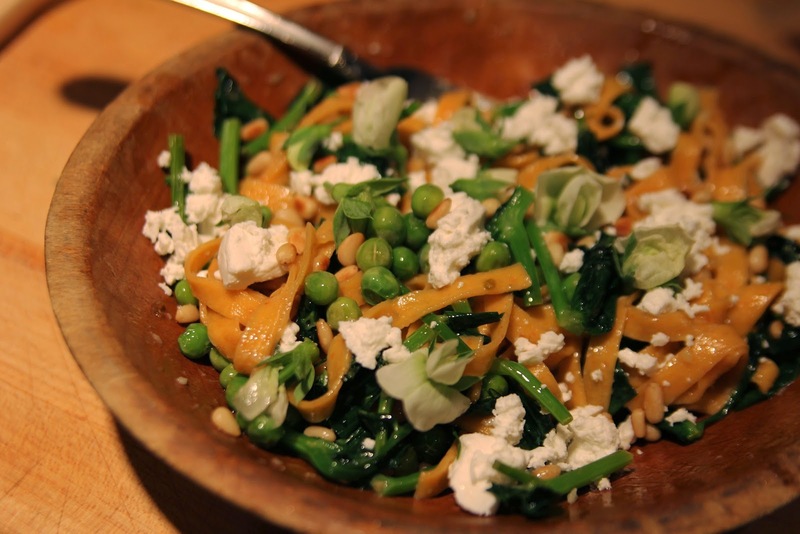 I tossed it all together and then added the pine nuts and goat cheese before topping the dish with the flowers. Dinner was on in perhaps 15 minutes. Local, seasonal, fresh. Delicious! Why Aren't You Using Chili Threads?